I’m Latina guys. I grew up loving lime and chili powder on my fruit, Mexican street corn, duritos with that fake lime juice that comes in a bottle and Valentina or Salsa Amor all over them. I mean ALLLLL over them until the duritos became a soggy ball at the bottom of your plastic bag at the swap meet. Who knows what I’m talking about? If you do you we just became friends! Variations: People make bloody marys many different ways. Every bar tender has their own variation. The same goes for a michelada. It can have just lime and salt or have more of a tomato juice base. 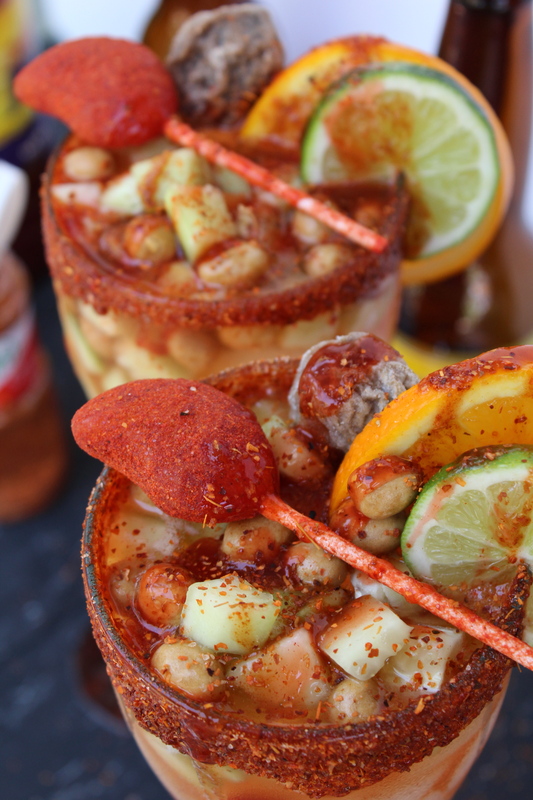 If your name is Jackie then you make a super flavorful michelada base and top it with a ton of Mexican toppings that are not usually included in a michelada, but make it so much more interesting. You can do whatever you want with a michelada! It’s okay if you don’t love spicy foods. This magical drink can be made however you like. Use less hot sauce, use more (I usually do), do what you want because it’s yours. Diclaimer: I had to share a ton of photos, because I love them all so much! 1. Add about a ½ cup of chamoy sauce to a small bowl and about a ¼ cup Tajin to another small bowl. To rim glasses dip the top of the glass into the bowl of chamoy and coat heavily. Immediately after dip the top of the same glass into the bowl of Tajin and coat it with the powder. Rim all glasses then set aside. 2. Make the michelada mix by combining all mix ingredients into a large glass or jar: clamato, chamoy, orange juice, lime juice, hot sauce and Tajin. Stir or shake well. 3. Fill rimmed glasses with a small amount of ice then add in as much michelada mix as you would like. This will depend on the size of your glasses and your preference. Top the ice and michelada mix with the chilled beer. 4. Lastly, add toppings: orange and lime slices, diced cucumber, peanuts, saladitos and spicy candy. Drizzle the top of everything with more hot sauce, lime juice, chamoy and Tajin. Serve immediately. • If you have a Mexican grocery store near you, you should be able to find all ingredients easily. If you don’t, check the Latin section of your grocery store. • These micheladas are great to serve at parties! To make it easier prepare a large batch of michelada mix in advance, and prepare all toppings and garnishes too. Yummmmm! I want the mich…. I will make them for us! Yay! I hope you enjoyed them!